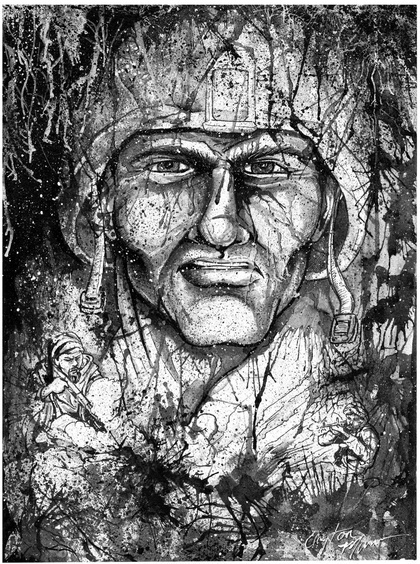 Once more, Clayton Murwin offers his artistic talent to The Journal of Military Experience providing powerful illustrations to accompany the 18 pieces of writing in the upcoming volume. Clayton, a self-proclaimed “comic book freak,” chooses to use his talents to give back to those who serve. “If a member of the military is willing to put their life on the line for me, someone they don’t know, the least I can do is what I do. What I am trying to do is write a check for a debt that can never be repaid.” Murwin explained in an interview. Founding Heroes Fallen Studios was one step toward this ambitious goal and a step that put him in contact with Military Experience and the Arts’ president who invited Clayton to create the illustrations for JME 2, to present a graphic novel workshop at the MEA Symposium, and once again to illustrate JME 3. Currently, Clayton is taking his illustration work to a new level as part of a collaborative effort to see 2 volumes of stories and illustrations about the Korean War reach publication. The volumes, formed from interviews conducted by MEA’s Scott Lee (Veterans’ PTSD Project) were slated for publication through the Department of Defense to coincide with the 60th anniversary of the Korean War; however, the recent government shutdown stopped the project. Clayton worked to have the rights to the works returned to Heroes Fallen Studios, and now is working to raise $2500 through the project’s Kickstarter campaign to publish the two volumes. The entire $2500 must be raised by 12pm November 16th, or all pledges are lost and a new method of funding must be found.